Comedian Mark Thomas will be at St Mary in the Castle next Wednesday – or will he? 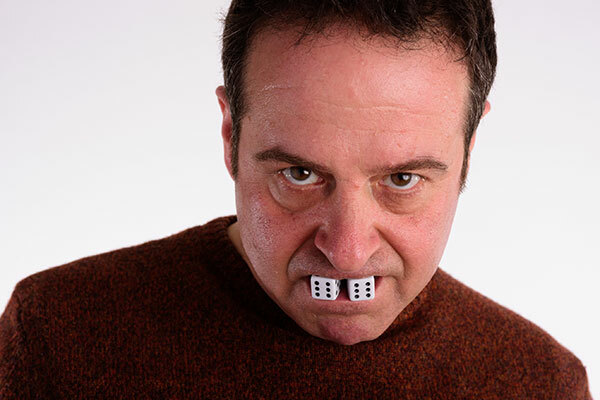 Comedian and activist Mark Thomas brings his sell-out Fringe show, A Show That Gambles on the Future, to Hastings’ St Mary in the Castle on Wednesday 13 December… or will he? Erica Smith quizzes him about what the future holds for us all. Few could have anticipated the events of 2016, and even fewer seem to know where they will lead us or where we are going. But fear not! Mark Thomas sets out to discover what the future has in store for us by collecting and examining his own predictions and those of his audiences before literally taking a gamble on their outcome. Hastings and St Leonards comedy lovers are no strangers to Mark Thomas and his democratic shows. As a Trustee of Hastings Furniture Service he has hosted several fundraisers for the charity. Remember The Manifesto Show? It was held at Azur in St Leonards – the only time the rather smart wedding venue has had such a pink-haired cider-swilling audience in the house. That night, St Leonards chose a manifesto clause close to the soles of the population rather than a revolutionary anthem: “Dog owners who don’t clean up after their pets should be made to wear a dog poo moustache”. On Wednesday, by making futurologists of us all, Mark will create a fantastical, hilarious and possibly accurate vision of the world –let’s face it, after Brexit; Jeremy Corbyn’s unexpected rise to lead the left and Trump leading the world into armageddon – anything we collectively dream up on Wednesday could easily come true! I asked Mark what sort of predictions have been raised so far on the tour. He played his cards close to his chest, not wanting to influence our visions. But he did let slip that in Canterbury, the ‘focus group’ at his show predicted that Greggs The Bakers will be nationalised! Come on Hastings – get your thinking caps on and let’s Trump that! With sell-out shows, non-stop awards, the highest critical acclaim, his own TV and radio shows, numerous documentaries, published books, Guinness World Records, influencing changes in the law, creating manifestos and exposing arms trade dealers, it’s no wonder that Mark is one of the UK’s most recognised performers and influential activists. Marks’ book, Liar’s Quartet, is out now via September Publishing. For more information, check out his website. Mark Thomas is at St Mary in the Castle, Hastings on Wednesday 13 December, 7pm for 7.30pm.